September, while sizzling my lard on the Turkish beach and sipping Efes Pilsen, I was thinking about the fact that I had already fulfilled one of the annual duties of a father and husband - having had a family holiday “in the South”. So it was high time to take care of the truly manly rest, which is fishing somewhere in the North. The target was salmon. I had decided that Kola Peninsula was the ideal place to travel to. So I set off. It was not the first time I was traveling to Kola, but it was the first time in the autumn. Among the people travelling together there was only one whom I knew beforehand, “Zombis” (Mindaugas) all the rest were unknown to me. Leonas joined us in Vilnius. One more fellow-traveller was Igor - a famous doctor and anaesthetist from Riga. People like them are a true gift during a trip like this. Perfect companions when communicating with native people in the vastness of Russia where the convention of drinking vodka for breakfast, lunch and dinner is still very much alive. Thus, our crew was finally formed in the territory of the brotherly Republic of Latvia. We were travelling from Riga to Tallinn, then to Finland, and having reached the North of Finland, we turned into Russia. The driving duties were carried out by “Zombis”. He took us to the promised land of salmon with a seasoned Mitsubishi Land Rover, which, as it was later revealed, was not so old and proved itself as a strong and nimble “race car”. Strong and nimble like its owner. “Zombis” a Lithuanian, tempered by the northern winds with manners and appearance of a joyful troll. He was taking the responsibility as a guide in the northern fishing. Perhaps the fact that before this trip he spent a lot of time in inclement Greenland talking to Valkyrie, made his aura sparkle especially bright. Sometimes he resembled a young devil from the animated films from my childhood. And while sitting at the table... Well, I digress. This is about fishing, isn't it? Early in the morning we reached the point Salla, which is in the northern part of Finland. After the border and customs formalities we broke into the vastness of Russia. It was obvious that we were in Russia. I could feel it with my spine, due to the rough road and the potholes. It threatened braking us to pieces. 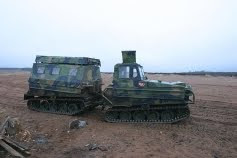 When driving through each larger hole the idea that our “race car” would give in before Kandalaksha was constantly slipping into my mind, but in spite of our grim forecasts our “race car” was swinging rhythmically as if teasing at Russian roads and its passengers. It was tossing us so that if we had an old man among us, his false teeth would have fallen apart. The “massage” wasn't finished before we reached Kandalaksha, but our spines were screaming for care. So having stopped at the gas station we started “balancing salt”. Perhaps it was strange to see four man “balancing salt”, but this exercise helps the spine disks to get back to its place and helps to avoid inflammation or strangulation of the nerve roots. There is quite good asphalt road to the East from Kandalaksha, to the estuary of Umba and Varzuga. A very small part is not yet complete, but I think in a couple of years there will be an excellent asphalt road all the way to the Varzuga river. The destination of our travel was Chavanga (Tchavanga, Chawanga) so we turned our “race car” to the estuary of Varzuga. “Ustja Varzugi” is a well known place, the symbol of which for many years was a ship turned on one side bearing an ambitious inscription TITANIK. Unfortunately, this ship is gone now. Local people explained that it was taken by the metal collectors. There is a local resident in the estuary of Varzuga. He has lived here so long. that even he himself does not remember when he settled. He has a boat, oblong and narrow with an antique engine. He took us with all our belongings to the opposite shore of Varzuga, and there a particular vehicle – a technical relic - was waiting for us. It was a ZIL. People who remember post-war years in the east, will remember the sputtering, coughing and roaring ZIL. 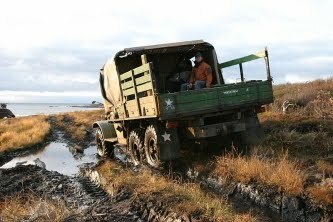 With only three bridges available in the Kola Peninsula it was necessary. It was climbing the rocks of the Kola like a beetle trying to reach a creamy bite at the top of kitchen cupboard. It was crawling through swamps, mocking at mud and water. It looked like the only goal for it was to take adventure seeking fishermen to the Northern rivers full of fish. As long as there will be fishermen, it will live and travel. Traveling with this monster is a unique experience. I felt like a potato, a piece of wood or a tennis ball. We were shaken so much that any doctor would easily diagnose brain concussion or light body contusion. After a while I realized, that if one does not want to break his neck driving the vehicle on the road peeved with nondescript size of the stones he has to use his hands, feet and teeth to grasp the sides of the body of the car. Otherwise - Amen. After five hours of shaking my forces have almost departed form me (all the way I was holding the wooden sides with my nails and teeth trying to keep myself in the trailer and not to fall out, together with that I was pressing the box of food to the floor with my leg as I wanted to preserve our food supply of the week. Believe me five hours of such “extreme” is quite a bit. Like even the longest and the darkest night sometime ends, the involuntary shaking of our team ended, too. Having swam across the Chavanga estuary, ZIL stopped at our “cottage”. I will not go into depths about the everyday life of the North. I have written about it earlier. The small houses of Kola villages belong to the Kolkhoz. The Kolkhoz, due to the activities and character of the chairman, is famous throughout the region. Life in the houses is livable. Water is taken from the well. A toilet is the “hole” in the entryway. Why entryway? In winter when the frost is heavy one does not have to run across the field and it is likely that your behind will not freeze to the “throne”. There are two rooms and two furnaces in the “cottage”. Electricity - twice a day. This is our life. 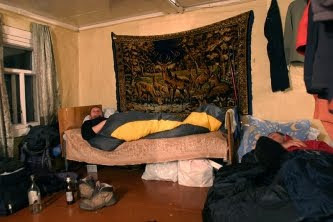 After such a “pleasant” journey, myself, “Zombie” and Igor tried to recover, stretching out on the bed allowing our bodies to rest after a long time of hard work. Leon went to the river. We had a nap, then ate and then received guests, a local old codger. He has lived in the village Chavanga at the Chavanga river all his life. He knows all the fish in the river, and calls the local bears by names. The old codger sat at the table, we asked him about the fish, questioned about pat holes and spillways of course with something liquid passing round the table, as it is custom here. I do not remember which round it was. We're measuring in half litters. But the moment came when the old codger promised to take us to the place where fish climbs ashore by itself, where the bottom of the river shines with silver and where bears go to accumulate their winter fat. We started to prepare our fishing rods, combed the flies, prepared snells, and tightened spool brakes. We were preparing ourselves seriously to fight salmon - the king of the river. After dark Leon returned. Scared and shaking not able to pull himself together. At first we thought that he was frozen due to wind, but having looked into his staring and big owl eyes, we realized that something has happened. We had poured something quickly into the glass and then into his throat. He swallowed the drops and started telling. It appeared that he had hooked something in the river. That something pulled him so hard that he was in the river by his waist before he noticed. But that something was pulling hard, hauling line and did not want to let go release. Leon was hooked by the “something”. It wasn't him who had hooked the “something”. He was fighting with that “something” for about an hour until the line broke. 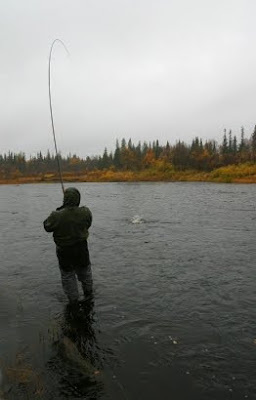 We were giggling, saying that he must have hooked a seal coming up the river for smelts, but inside ourselves we were thinking one thing only: new fish was in the river. We would have fun, would have an adrenaline rush. The morning was sunny, but windy. The wind increased further while we had breakfast. After a while it clouded over and began to rain and sleet too. In this weather the master would keep his dog inside - and we were preparing for fishing! We were walking along the river, in the swamps until we were a few kilometers above the village. Here the river flows in a little valley and makes a twist. One can wade in the water almost to the other side. An ideal place for fishing. I decided to look for fish there. I was casting, trying to attract fish while the old codger from the day before attracted a beautiful, silvery female salmon of some 5 kilograms or 10 lbs. 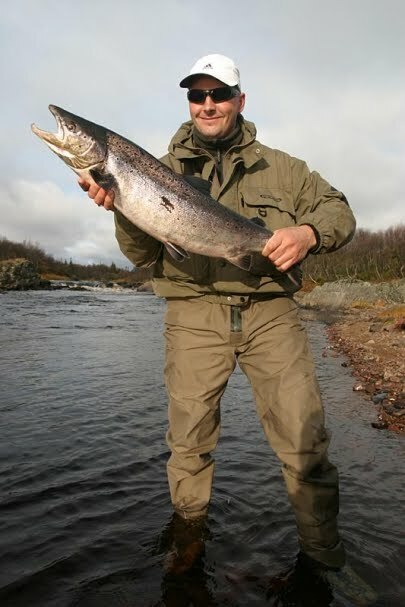 He proficiently grasped the salmon by its tail, crowned it with a rock and bundled it into his sack. Shortly after a fish took my offerings. A male salmon had shown interest in a pink fly. A beauty, spruced in its wedding garment, bronze with bright red dots and a very bright belly. 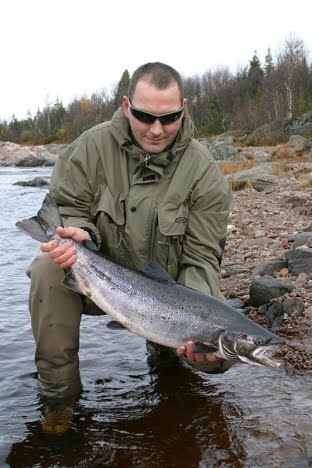 I hadn’t seen such beautiful fish before, but then I haven’t fished the autumn in Kola before. In Lithuania I usually don't fish during the spawning season. The toddler was not large. About 2 kilograms or 4 lbs., but spectacular. A brief photo session and the fish was freed. We were crossing the river the whole day, and caught a few more toddlers. My body was covered with a wonderful sense of tranquility. Everything around had the smell of North. Lying on the shore I watched fish jumping in the river. I pulled out a flask; a sip of peat drink warmly ran down the throat pleasantly dizzying the head. It was time to go home. The body was calling for rest. We had had a long talk about fishing in the candlelight in the evening. Candlelight because the electricity here ends at midnight. We had recalled our previous trips and gone to bed late. “Zombie” the troll offered to travel through the swamp, but only in the places we the locals mow the grass. The proposal was accepted, so in the morning led by “Zombie” we were making our way through the swamp. We were going for six kilometers, not not just a few hundred meters. To tell the truth I wanted to drown “Zombie” in the swamp, but the diabolic child felt right at home. It is very difficult to make one's way through the swamp. Some places the water barely covers your boots, some places you go in to the waist. You climb to the top and everything starts over again. You jump from hump to hump. Miss the hump and you are in the wetland to the waist. The heart pounds in a monstrous speed, and the pulse is so hard that one can feel the neck arteries. Finally we somehow reached the fishing spot. There were lots of fresh piles indicating that we were not alone here - that there were bears around. One, two, three? Nobody knows. The fish were biting perfectly, but all were black. We thought that we were on the spawning grounds, but after having examined the bottom, I understood that this wasn't the case. The spawning waters were most likely further up the river. We were not going there. Let the fish make children. We were fine here. I had noticed a large male. It was poking around, showing back and tail like a dolphin. The fish was spectacular, with a tail as large as my two hands - and they are bigger than on an average man! I was casting to the male for a long time, but didn’t catch it. It would have been a nice photo, but I failed. Fishing in Kola is an extreme. In addition to salmon one can see a bear or meet an elk or a deer. Wild horses live along the lake near the village. The following incident happened some time ago: a drunk tourists came out of the village shop with bread loafs and several stallions wrestled him to the ground and robbed the bread. I tried to take a photo of the wild horses. They disliked it and one stallion with black mane showed his teeth and galloped towards me. I had to jump on the old ZIL to avoid him. I have been to the Kola peninsula many times, but this was the first time in the fall. It is somehow unusual that night comes in Kola. When coming to Kola in the summer it is light all day long, and this time we had to spend evenings in the candlelight. Electricity in the village is turned off at midnight, so there are only two options left: either going to sleep, or to sit in the candlelight. We were sitting, spending the evenings talking. During the evening talks we decided to go up the river with the land-rover. The running costs of the land-rover is about twelve dollars per kilometer. Too expensive for your taste? Try to find it cheaper in the tundra! But we decided to go anyway. In the morning a Volvo 4WD was waiting for us. I liked this Swedish machine. So small, light, maneuverable, petrol-powered four-cylinder engine, with thick tires. We went about twelve kilometers up the river with it. We were brought to the upper resort where a Polish group had been fishing a week before. They had a fantastic catch of a silver fish going upstream. This information made our eyes bright. We were certain to catch now. The salmon were biting perfectly. Lots of fish were jumping in the river. During that day I managed to catch eight salmon. All smartened with wedding clothes, beautiful and colorful. However, salmon does not spawn in this part of the river - the bottom of the river is still unsuitable. The salmon prepare to spawn much higher up the system. I have been in such places where the bottom is gravel. Small, nice stones. This is where the spawning is happening. We had caught a lot of fish, but we didn’t find fresh, bright fish, that had come recently from the sea. Apparently, the school that came ten days ago had already gone upstream in the river, where they were waiting for the time of spawning. The day passed quickly. The whole team got about forty fish. Impressive! We reached home in the dark. We had enjoyed good fishing, but we also enjoyed the sauna with birch brooms, where we could revive our bodies, aggravated with pleasant tiredness. I have to say that the sauna was perfect without luxury attributes the exact “ruskaja bania”. Steam was hissing in the steam-room, lightness filled the chest, heat percolated to the bones. I was lying on the bunk and my mind was flying above the river where I saw fish shimmering with silver. Fishermen were nearby on the shore with fish soup made of fresh fish. I felt like shouting out “Oh... Liapota!”. I like the sauna. I have built one at home. A sauna is a part of the life style here. We sat at the table after the sauna. I haven’t spent such a nice time in a long time. We even forgot that the world is shaken with financial crisis. I cared about nothing except for the fly I was going to use tomorrow, where we would go, what to expect from a increasing wind and rain. I even didn’t think about that the holiday in North came to an end. I glanced into the mirror - a completely different person was looking back at me, with weather-beaten cheeks, two-week beard, green eyes, and not even a drop of tiredness from work! In the mirror I saw a happy person enjoying life. The one I used to see some twenty years ago. I didn’t want to pack my things and leave this beautiful land. I speculated that it might be my last trip to the Kola Peninsula. I have been here six times. Perhaps a bit too much for one country. Life is short, and therefore one wants to see new places and choose other fishing trips. Moreover, Russia is no longer as it was ten years ago. Materialism has made its way here, too. Local “businessmen” require much more than the service costs in Western Europe. This spoils the mood, as the local “player” is a monopolist, as he is a businessman as well as the government representative, and has no competitors. Therefore he is forcing you to pay a lot for nothing. This gets on your nerve these days in Kola. I think another trip should be to the North of Norway. There are a lot of rivers that I didn't fish. Also I would like to show the North to the family, for them to finally understand that the Southern resorts are not for me.